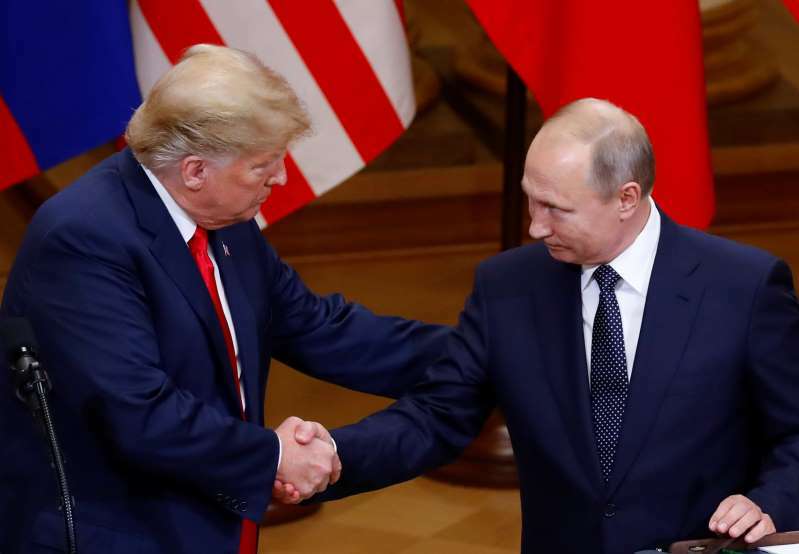 President Donald Trump and Russian President Vladimir Putin shake hands Monday as they hold a joint news conference after their meeting in Helsinki, Finland. President Donald Trump met face-to-face with Russian President Vladimir Putin in Finland on Monday before a joint news conference that largely downplayed Russian interference in the 2016 election. [post_ads]The two leaders’ meeting comes three days after 12 Russian intelligence officials were indicted by the U.S. government for their involvement in hacking the Democratic National Committee during the election. Here are some of the press conference’s takeaways. Trump sides with Russia over the U.S. intelligence community. When asked if he believed the U.S. intelligence community’s conclusions that Russia meddled in the presidential election, Trump said Putin had given him a “strong and powerful denial” about Russian involvement. “He just said it’s not Russia,” Trump said of the Russian leader after criticizing the FBI’s investigation for not going after a missing DNC server and missing emails belonging to his opponent in the election, Hillary Clinton. Putin wanted Trump to be president. Putin admitted that he wanted Trump to win the election when asked by a reporter, reasoning that Trump had discussed “normalizing” the United States’ relationship with Russia. Trump said he ran a “clean” presidential campaign. “There was no collusion at all, everybody knows it,” he said, adding once again that he ran a “clean campaign” in 2016. He stressed that the investigation “has had a negative impact” on the two countries’ relations. Trump says U.S.-Russian relations are improving. He went on to say that he chose talking with Putin over silence. Trump says U.S. and Russia are both to blame for poor relations. “We’ve all be foolish. We should have had this dialogue a long time ago,” he said. Trump differs with Putin on Crimea. Putin defended the annexing of Crimea but acknowledged the U.S. had criticized the takeover. When asked if he has any “compromising material” on Trump, Putin dodged the question by suggesting that such an opportunity wouldn’t be possible. Putin said he had no knowledge of Trump’s past business trips to Russia when they were happening and that he could not keep track of or monitor every single person who traveled to his country. He asked the media to dismiss such thoughts. “If they had it, it would have been out long ago,” Trump added. Trump trashed recent testimony given by an FBI veteran.